I was going to write about Stephen Miller’s ballsy takedown of CNN’s truly awful Jim Acosta but the brilliant Daniel Greenfield beat me to it at FrontPageMag. There were so many great moments, so many gems in the press conference today that I can’t resist pasting the text of the full transcript at the bottom of this post. At the White House, Miller outlined the Trump administration’s long overdue proposed revamping of America’s antiquated immigration laws, which discriminate against well-rounded would-be immigrants who speak English. Trump wants the immigration system to emphasize merit and employability, as opposed to familial relationships. Acosta baited Miller, falsely suggesting that a poem at the foot of the Statue of Liberty was somehow an American foundational document. And of course he implied the immigration reform plan was racist. Then Acosta interrupted Miller, as the supremely arrogant haircut is wont to do. Milled added: “So, you say that a million a year is the Statue of Liberty number. 900,000 or 800,000 a year would violate it. It’s not just that they’re totalitarians. It’s not just that they want to destroy America. It’s that they’re really stupid. Watch as CNN’s Jim Acosta tries to debate Trump adviser Stephen Miller. 2. The ideal immigrant is illiterate and unskilled. Possibly violent and a burden on society. How the two are supposed to work together is something you’re not supposed to ask. Now this is the kind of Trump reality TV I could get used to. MS. SANDERS: Good afternoon, everyone. MR. MILLER: Thank you. Great to be here today to talk with you about the President’s new proposal for immigration reform. I’ll just walk through the basics of it and then we’ll take some questions and hopefully be able to answer all of them. So this is the largest proposed reform to our immigration policy in half a century. The most important question when it comes to the U.S. immigration system is who gets a green card. A green card is the golden ticket of U.S. immigration. Every year we issue a million green cards to foreign nationals from all the countries of the world, but we do so without regard to whether that applicant has demonstrated the skill that can add to the U.S. economy, whether they can pay their own way or be reliant on welfare, or whether they’ll displace or take a job from an American worker. And as a result of this policy, in place now for many years, we’ve seen significant reductions in wages for blue collar workers, massive displacement of African American and Hispanic workers, as well as the displacement of immigrant workers from previous years who oftentimes compete directly against new arrivals who are being paid even less. So it’s a policy that’s actually exacerbated wealth inequality in the country in a pretty significant way. So you’ve seen over time, as a result of this historic flow of unskilled immigration, a shift in wealth from the working class to wealthier corporations and businesses. And it’s been very unfair for American workers, but especially for immigrant workers, African American workers, and Hispanic workers, and blue collar workers in general across the country. At the same time, it has cost taxpayers enormously because roughly half of immigrant head of households in the United States receive some type of welfare benefit — which I know is a fact that many people might consider astonishing, but it’s not surprising when you have an immigration system that doesn’t look at questions like skill level or self-sufficiency. And so this proposal has several major historic changes. First, it eliminates so-called chain migration. So right now, what does chain migration mean? It means that if you come into the United States on a green card — and just so we’re all clear, a green card gives the recipient lifetime work authorization, the ability to bring in their family members. It gives them a fast track to U.S. citizenship and, with that, all the benefits that come with being an American citizen. And so the individuals right now who are receiving green cards, they can bring in, say, an elderly relative who could immediately go on to public assistance if they become unable to support themselves financially. And then that person can bring in a relative who can bring in a relative who can bring in a relative, and that’s why they call it chain migration. And over years, that has massively de-skilled the migrant flow into America and produced all of those effects I’m talking about. So we’re proposing to limit family-based migration to spouses and minor children. Additionally, we’re establishing a new entry system that’s points-based. Australia has a points-based system, Canada has a points-based system. And what will this system look at? It will look at: Does the applicant speak English? Can they support themselves and their families financially? Do they have a skill that will add to the U.S. economy? Are they being paid a high wage? The last part is very important because it will help prevent displacement of U.S. workers. So if a company — let’s say they’re offering three times the median wage, that person will get more points on their application than if they’re being offered two times the median wage or one time the median wage. So all of a sudden, you’re putting upward pressure on wages instead of downward pressure, and you’re making it very hard to use immigrant labor to substitute for American workers because by prioritizing higher paid workers, you basically end the practice, more or less, of being able to seek out permanent residents to come in at lower pay. And so that’s a major historic change to U.S. immigration policy. The effect of this, switching to a skills-based system and ending unfettered chain migration, would be, over time, you would cut net migration in half, which polling shows is supported overwhelmingly by the American people in very large numbers. And I’ll just conclude by saying this is what President Trump campaigned on. He talked about it throughout the campaign, throughout the transition, and since coming into office. This is a major promise to the American people to push for merit-based immigration reform that protects U.S. workers, protects U.S. taxpayers, and protects the U.S. economy, and that prioritizes the needs of our own citizens, our own residents, and our own workers. It’s pro-American immigration reform that the American people want, that the American people deserve, and that puts the needs of the working class ahead of the investor class. So with that, I would gladly take a few questions. Q Thank you, Stephen. You talk about the President’s agenda and wanting to implement it. But obviously if this doesn’t become law, it won’t be implemented, and there’s already resistance in Congress, specifically from Republicans, even the day that you’re rolling out this plan. How do you plan to overcome that? Where are the compromise points for the President and this White House? MR. MILLER: It’s been my experience in the legislative process that there’s two kinds of proposals. There’s proposals that can only succeed in the dark of night and proposals that can only succeed in the light of day. This is the latter of those two. The more that we as a country have a national conversation about what kind of immigration system we want and to whom we want to give green cards to, the more unstoppable the momentum for something like this becomes. Q So there’s room for change? MR. MILLER: Public support is so immense on this — if you just look at the polling data in many key battleground states across the country — that over time you’re going to see massive public push for this kind of legislation. Because immigration affects every aspect of our lives. It affects our schools, our hospitals, our working conditions, our labor market, our tax base, our communities, and it’s a deeply personal issue for Americans. And so you’re going to see massive public support for this. And ultimately, members of Congress will have a choice to make. They can either vote with the interests of U.S. citizens and U.S. workers, or they can vote against their interests, and whatever happens as a result of that, I think would be somewhat predictable. Let me go to John and then we’ll move back. Q How do you wedge this into an already jam-packed legislative calendar? MR. MILLER: Well, ultimately we’re going to have to have conversations with Senate leadership and House leadership about the steps forward. But this is an issue that we campaigned on, the American people voted for by electing Donald J. Trump as their President, and that is of enormous importance to the American economy. Because again, we’re protecting blue-collar workers and we’re bringing in workers who can add to the economy. And so I really think this is a really historic moment that happened today. Again, the biggest proposed change that would take place in 50 years. At a time in which you have automation that is replacing a lot of jobs in the United States, you have American workers without high school diplomas who have very low participation rates in the labor force, and then you’re bringing in workers to compete directly against the workers who are either losing their jobs to automation or who can’t find work because there’s not enough jobs for workers in our own country without education. And so particularly — I mean, go to an American city that has labor force problems, wherever that may be — say, Detroit. How is it fair or right or proper that if, say, you open up a new business in Detroit, that the unemployed workers of Detroit are going to have to compete against an endless flow of unskilled workers for the exact same jobs, reducing pay for those positions, and reducing their chance of getting those jobs while, at the same time, ultra-high-skilled workers are in the back of the line to get into the country? It makes no sense. The numbers are too large, and the numbers of low-skilled workers in particular is a major detriment to U.S. workers. So I think the more we have this conversation publicly and ask America who ought to get a green card in this country, the more momentum there’s going to be, the more support there’s going to be. And our message to folks in Congress is, if you are serious about immigration reform, then ask yourselves, what’s in the best interest of Americans and American workers, and ultimately this has to be a part of that. All right, let’s go to Glenn. Q Two quick questions. First of all, let’s have some statistics. There have been a lot of studies out there that don’t show a correlation between low-skilled immigration and the loss of jobs for native workers. Cite for me, if you could, one or two studies with specific numbers that prove the correlation between those two things — because your entire policy is based on that. MR. MILLER: Glenn, Glenn, Glenn — I named the studies. I named the studies. MR. MILLER: And ask them — ask them how this has affected their lives. MR. MILLER: Look at — I just told you. MR. MILLER: If you look at — first of all, if you look at the premise, Glenn, of bringing in low-skilled labor, it’s based on the idea that there’s a labor shortage for lower-skilled jobs. There isn’t. The number of people living in the United States in the working ages who aren’t working today is at a record high. One in four Americans — or almost one in four Americans between the ages of 25 and 54 aren’t even employed. For African American workers, their labor force participation rate who don’t have a high school diploma — I guess, African American males without a high school diploma has plummeted some 40 percentage points since the mass wave of unskilled migration began. The reality is that, if you just use common sense — and, yes, I will use common sense — the reason why some companies want to bring in more unskilled labor is because they know that it drives down wages and reduces labor costs. Our question as a government is, to whom is our duty? Our duty is to U.S. citizens and U.S. workers to promote rising wages for them. If low-skilled immigration was an unalloyed good for the economy, then why have we been growing at 1.5 percent for the last 17 years at a time of unprecedented new low-wage arrivals? The facts speak for themselves. At some point, we’re accountable to reality. On the other hand, like I said, you have ultra-high-skilled workers who are at the back of the line, which makes no sense in the year 2017. Neil, let me go to you. MR. MILLER: There’s no doubt at all — and then I’ll go to Neil — but there’s no doubt that it’s very, very sad and very unfair that immigration policy, both legal and illegal, over the last several decades has had a deleterious impact on African American employment in general, and certainly African American males that has been quite tragic. And we, as a country, have to have a conversation about that. Q Thanks very much. So one of the arguments made against this bill is that large-scale immigration will increase the total number of jobs. Senator Graham, for example, said he wants more immigration to bring in more restaurant jobs, more resort jobs, bed cleaning jobs, and such like. Is it better for this country to have more jobs or higher wages and higher productivity for Americans? MR. MILLER: Well, I think at the end of the day, President Trump has been clear that he is a pro-high-wage President. He ran as a pro-high-wage candidate, and that’s what this policy will accomplish. At the same time, to the point about economic growth, we’re constantly told that unskilled immigration boosts the economy. But again, if you look at the last 17 years, we just know from reality that’s not true. And if you look at wages, you can see the effects there. If you look at the labor force, you can see the effects there. And so again, we’re ending unskilled chain migration, but we’re also making sure that the great inventors of the world, the great scientists of the world, that people who have the next great piece of technology can come into the United States and compete in a competitive application process — a points-based system that makes sense in the year 2017. All right, let me go to you. Q Two questions. One, you did personalize it with the New York Times, so normally this wouldn’t be a question, but will the Trump organization stop bringing in foreign workers on visa programs to set an example for other businesses in the interim before this bill becomes law? MR. MILLER: Well, as you know, the only way to have immigration policy work is it has to be national; it has to be uniform. You can’t have different rules and different procedures for different companies. This bill, of course, doesn’t deal with guest workers and temporary non-immigrant visas, which is, I think, what you’re asking about, and that’s a separate thing. But the President was clear, if you go back and look at his debate on this during the primary, where he said, as a businessman, my responsibility is to operate my business according to the laws of the United States as they exist. He said, as President, my responsibility is to pass laws that make sure we have an immigration system that prioritizes American workers. He said that throughout the campaign, and he said it as a candidate, and he said it now. But just as a technical matter, you’re talking about a different aspect of the immigration system. Today, we’re talking about the green card system, but it’s a good question. Let me move on. Over there. MR. MILLER: Hold on a second. Q Thank you, Stephen. Just to take the question in another direction, USA Today and others have shown that over the last seven years, there’s been a negative flow of immigration across the southern border. And of course, unemployment is at, perhaps, a 10-year low right now. So will there be enough workers in the southwest states if this policy were to go into effect? MR. MILLER: Well, yeah. So I think we’re talking about different things, and I appreciate the question. Net migration overall has been at a record pace. You’re talking, I think, just about some questions about net migration illegally across the southern border. MR. MILLER: We’re talking today about green card policy. Every year, we issue a million more green cards and it just keeps adding on every year after year after year. And so the supply of foreign labor is at a record high. I think the foreign-born population right now is 45 million and I think there’s 25 million foreign workers in the United States. Q Thank you, Stephen. Two questions for you. First, does the Trump administration plan to defend the DACA program that Texas and eight other states bring a lawsuit challenging the court? MR. MILLER: Well, we are not going to make an announcement on that today because there is ongoing litigation, and DOJ and DHS are reviewing that. But I will say that whatever we do is going to prioritize the interests of American citizens and workers. Q Stephen, Zoe Daniel from Australian Broadcasting. You’ve talked about the Australian policy. Can you speak more specifically about what the administration likes and also how that extends into things like family sponsorship? You mentioned bringing in elderly relatives, for example, who might not be productive. Yet in Australia, adult children can sponsor their parents to immigrate. So which elements of the policy are you choosing that you might liken to Australia’s? MR. MILLER: Right. So we looked at the Australian system, the Canadian system. We took things we liked. We added things that made sense for America and where we are as a country right now. One of the things I think is the most compelling about the Australian system is the efforts to make sure that immigrants are financially self-sufficient and make sure they’re able to pay for their own healthcare and things of that nature. And that’s certainly one of the things we took from that, and obviously the points-based system that Canada has has a lot to recommend it. And we actually — we took that and we added things that are all new to it and that were released today, and made sure that we have a highly competitive application process. Look, there’s 7 billion people in the world, and so the question of who gets that golden ticket needs to be a discerning process that makes sense. Again, in an environment in which you have this huge pool of unemployed labor in the United States, and you’re spending massive amounts of money putting our own workers on welfare, doesn’t it make sense economically to say, let’s get our own workers, immigrant and U.S.-born, off of welfare, into the labor market, earning a living wage, able to pay into taxes, instead of bringing in lower-wage substitutes while at the same time ensuring that the inventors, the innovators, and the scientists are able to come into our country and add to our economy and our GDP, but not as substitutes for Americans? Q Thank you so much. Can you respond to some of the critics within your own party who say what we really should be focused on is comprehensive immigration reform in order to really tackle the problem in a serious way? And secondly, what do you say to those who say this just separates families and it’s effectively cutting an effective (inaudible)? MR. MILLER: Well, actually, legislation for folks who are already here, they are able — who have pending family-based sponsorships — they’re actually grandfathered in. So it’s a new system moving forward. Point one. And point two is that, beyond the immediate family members that are covered in the bill — i.e. your minor children and your spouses — your other relatives can come in; they just have to come in through the points-based system. And then your first part of your question? Q My question about comprehensive immigration reform. Some Republicans are saying that you should be focused on comprehensive immigration reform instead of a sliver of the problem in order to really address the growing — problem of immigration. Why not tackle it from that stance? MR. MILLER: Let me ask a hypothetical, and I mean it in all sincerity. Let’s say that we had introduced a 2000-page comprehensive immigration reform bill. Would we be having this conversation today about Green Card policy? I suspect we wouldn’t be. I think it’s time that we forced the conversation onto this core issue. I know the President feels that it’s enormously advantageous to have a conversation about this core aspect of immigration reform because it does receive so little discussion, and yet it’s so enormously important. Q Follow-up on that Stephen? MR. MILLER: Hold on. Let’s go to you. Q Thank you, Stephen. You mentioned lawmakers have a choice to make. Is President Trump going to make this a campaign issue next year? MR. MILLER: Well, we’re making it an issue, period, starting — well, he started in the campaign when he was running, but as far as a real push for change, that begins in earnest aggressively starting today. And I do think — I just work on the policy side — but I do think that voters across the country are going to demand these kind of changes because, again, of the effects it has on their lives and their communities. And this is overwhelmingly popular. And I challenge any news organization here: Do a poll. Ask these questions: Do you think we should favor applicants to our country who speaks English? Yes or no? Do you think that we should make sure that workers who come into our country don’t displace existing American workers? Do you think people who come into our country should receive welfare or be financially self-sufficient? Do you think we should prioritize people based on skill? Do you think that we should reduce overall net migration? Do you think we should have unlimited family chain migration? If you ask any of these questions — look at the polls. Look at the results you’ll get in your own news organizations, and they’ll be very clear. Q Two for you. First, following up on Noah’s question, the President has talked a lot about immigration reform — this has been held up in the past. He has the power today to take personal action on this by changing the way his Trump properties, Mar-a-Lago and others, bring in unskilled foreign workers, displacing, as you talked about, large numbers of Americans who are looking for work in these states. So is the President planning on taking that action? And secondly, does this signal that the White House does not believe that any sort of comprehensive action on immigration is possible with this Congress; that immigration needs to be tackled in a piecemeal fashion going forward? MR. MILLER: Well, again, just as a technical matter, you’re talking about non-immigrant and guest worker visas, and this legislation deals with Green Cards, i.e. permanent immigration. So they’re two totally separate categories. But I’ll just refer everyone here today back to the President’s comments during the primary when this was raised in a debate, and he said: My job as a businessman is to follow the laws of the United States. And my job as President is to create an immigration system that works for American workers. And that’s one of the reasons why I think Americans so deeply admire President Trump is because they see every day he’s not working for himself. He has said over and over again: I’ve been very successful. I’ve had a great life. Now I’m here to work for the American people. But for any immigration system to be functional and to work, it has to be uniform across the board. One standard for everyone. Q Can you say how close the President is to getting a nominee for DHS? And can you add — if this legislation is not moving by the end of the year, how much is it possible for you to do through executive action, if any? 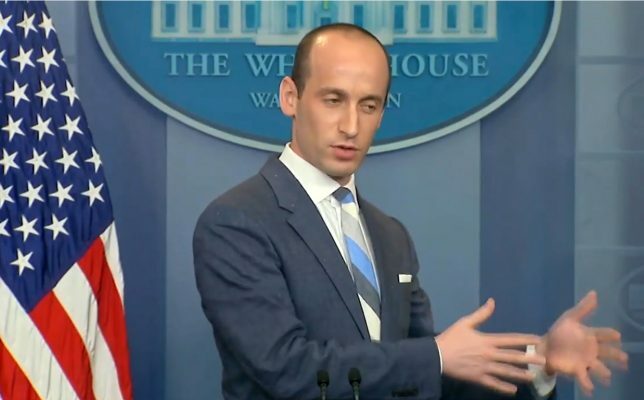 MR. MILLER: Well, I certainly think that on the administrative action front, you can tighten up and continue to tighten up enforcement on visas rules and standards. And I think that’s certainly something that we’d been looking at doing. But we’d like to create a permanent change to our immigration system that will endure through time, that will still be in place many decades from now. And that’s what this legislation would accomplish. And I would just, again, encourage everyone to understand the depth of this change. What President Trump has done today is one of the most important legislative moves that we’ve seen on this issue in many, many years. The President of the United States said, I’m taking a stand today for American workers and the American economy, and we’re putting American families first on immigration. We’re saying our compassion, first and foremost, is for struggling American families, and our focus is on the national interest. That is a major event, and all of your news organizations should take a hard look at the polls on these questions and see where folks are. And you’ll see that this is an issue that’s supported by Democrats, independents, and Republicans across the board. One last question and then I’ll hand it back to Sarah. MR. MILLER: Maybe more than one. Maybe two. I hear a lot of energy — I’m getting a lot of energy from upfront here. Q If this is so huge and major — you make it sound so enormously important — why did the senators who were with the President today call it modest and incremental? Is it modest and incremental? And aside from that, you seem to be suggesting this is immigration reform. Does this come even close to stemming illegal immigration for the President? Q So it’s modest and incremental? MR. MILLER: Of course, you shouldn’t have foreign workers displacing American workers. In Washington, this represents a sea change from decades of practice. So it just depends what lens you’re looking at it through. MR. MILLER: It just depends what lens you’re looking at it through. I guarantee you, go to, say, like an ed board for a couple of your papers, and see what they think about it. They’ll see it as a sea change. Talk to an everyday guy in the street and he’ll say this is the most commonsense thing — or she’ll say this is the most commonsense thing that I’ve seen in my entire life. And it’s right down, straight, the center of American politics and American political views. So I’ll take one last question. Who has — so I’ll do for the last question, right here. Q Thank you. I appreciate it. And thank you very much for coming out here and talking to us on camera. But I’d like to ask you if you’ve recently spoken with your old boss and what you make of the rift between President Trump and the Attorney General. You worked for Jeff Sessions for many years. MR. MILLER: I think Sarah has already spoken about that at length, and that’s not why I’m here today. But I think, if I remember what she said correctly, I’ll say it again: The President has confidence in all of his Cabinet and expects them to perform their duties honorably and fully and on behalf of the American people. But since the last question is not on the subject at hand, I will take one actual last question on the subject at hand. Q — has always thought of as immigration coming into this country? Q — and they’re not always going to speak English, Stephen. They’re not always going to be highly skilled. They’re not always going to be somebody who can go to work at Silicon Valley right away. Yes, people who immigrate to this country can eventually — people who immigrate to this country not through Ellis Island, as your family may have, but in other ways, do obtain a Green Card at some point. They do it through a lot of hard work. And, yes, they may learn English as a second language later on in life. But this whole notion of “well, they have to learn English before they get to the United States,” are we just going to bring in people from Great Britain and Australia? MR. MILLER: Jim, that is one of the most outrageous, insulting, ignorant, and foolish things you’ve ever said, and for you that’s still a really — the notion that you think that this is a racist bill is so wrong and so insulting. Q Are you targeting the African American community? Now you brought it up again — you said you wanted to have a conversation and not target. Is it going to be a targeted effort? You keep using the African American community. Are you going to target? I’m not trying to be funny, but you keep saying this. MR. MILLER: — we want to have an immigration system that takes care of the people who are coming here and the people who are already living here by having standards, by having a real clear requirement that you should be able to support yourself financially, by making sure that employers can pay a living wage. That’s the right policy for our country, and it’s the President’s commitment to taking care of American workers. Q I think she’d like to reclaim her time. MR. MILLER: I think that was exactly what we were hoping to have happened. Thank you. MS. SANDERS: Thank you, Stephen. Well, the transition back should be pretty fun and simple. Thank you. That was exciting. Throughout this week we’ve been talking about the American Dream and all that it signifies for people of all ages and nationalities. This morning, Counselor to the President Kellyanne Conway and Advisor to the President Ivanka Trump hosted a listening session with military spouses on the unique challenges they face in finding and maintaining employment to support their families. And yesterday, we hosted over 100 small businesses for a discussion on how they help to keep the American Dream alive for millions of workers around the country. As I mentioned last week, I want to take time to recognize people from around the country that write in and ask the President questions. And today I wanted to read you a special letter to the President from someone who embodies the enterprising and ambitious spirit of America. Frank from Falls Church, Virginia wrote: “Dear Mr. President, it would be my honor to mow the White House lawn for some weekend for you. Even though I’m only 10, I’d like to show the nation what young people like me are ready for. I admire your business background and have started my own business. I have been mowing my neighbors’ lawns for some time. (Please see the attached flier). Here’s a list of what I have and you are free to pick whatever you want: power mower, push mower, and weed whacker. I can bring extra fuel for the power mower and charged batteries for the weed whacker.” And he’ll do that with no charge. Frank, I’m happy to report back to you that I just spoke with the President and he wanted me to be sure and tell you that you’re doing a great job and keep working hard. He also asked me — we found out when we called — to let you know that we would be reading this letter to wish you a Happy Birthday. I think Frank went from 10 to 11 in the time that we received and were able to respond to this letter. And he also wanted me to invite you to spend a morning here at the White House with the groundskeeper. The groundskeeper — we’ve talked to them, and they would love to show you how the U.S. Park Service maintains the 18 acres of the White House complex. And he’d love to give you the opportunity to cut the grass in the Rose Garden. It’s our responsibility to keep the American Dream alive for kids like Frank, immigrants who are already here, and those who dream of immigrating here in the future. Q Does the President believe that white applicants to college are the victims of discrimination? MS. SANDERS: Quite an accusatory question, but I’d be happy to respond. The New York Times article is based entirely on uncorroborated inferences from a leaked internal personnel posting in violation of Department of Justice policy. And while the White House does not confirm or deny the existence of potential investigations, the Department of Justice will always review credible allegations of discrimination on the basis of any race. And I don’t have anything further on that. Q Sarah, thank you. Why did the President say that he received a phone call from the leader of the Boy Scouts and the President of Mexico when he did not? Did he lie? MS. SANDERS: No. On Mexico, he was referencing the conversation that they had had at the G20 Summit, where they specifically talked about the issues that he referenced. In terms of the Boy Scouts, multiple members of the Boy Scout leadership, following his speech there that day, congratulated him, praised him, and offered quite — I’m looking for the word — quite powerful compliments following his speech. And those were what those references were about. MS. SANDERS: They were actually — they were direct conversations, not actual phone calls. Q So he lied? He didn’t receive that phone call? MS. SANDERS: I wouldn’t say it was a lie. That’s a pretty bold accusation. MS. SANDERS: The conversations took place. They just simply didn’t take place over a phone call; that he had them in person. Q Sarah, if I could ask a couple of questions about Russia. Dmitry Medvedev, the Prime Minister, has weighed in on the President’s signing of the sanctions, saying that this proves that the Trump administration is “utterly powerless” and ends hopes for better ties. What’s the White House response? MS. SANDERS: Look, this morning, the President signed the Countering America’s Adversaries Through Sanctions Act. The President favors tough measures to punish and deter the bad behavior of the rogue regimes in Iran and North Korea. And he also sent a clear signal that we won’t tolerate interference in our democratic process by Russia. The bill was improved, but Congress has encroached on the power of the presidency, and he signed it in the interest of national unity. We’ve been very clear that we support tough sanctions on all three of those countries. We continue to do so. And that has certainly not changed, and I think that was reflected in the statements today. Q One point on one of the finer aspects of the bill and the findings — it stated that Russia did, in fact, try to interfere in the U.S. election. In the President’s statement — on the signing statement, he did not quibble with that. Is that an indication that he does accept the finding that Russia interfered in our election? MS. SANDERS: The President has already said that himself directly at the press conference in Poland. Q He’s also said that other actors may have been involved. MS. SANDERS: May have been involved as well. But he doesn’t dispute the fact that Russia was, and he said that in Poland at the press conference that I believe you were present for. Q One more. You said on Monday that, when you had something to say about the Russian action on the 755 diplomats, you would say something about it. Do you have anything to say about it today? MS. SANDERS: No, I don’t. But when I do, I’ll let you know. Q Sarah, thanks. Did President Trump speak with Russia’s President, Vladimir Putin, prior to signing the bill or at all today? Q That’s definitive? That’s confirmed? Let me just ask you something about North Korea. General McCaffrey said that, “I think at some point we are clearly going to take dramatic action short of war against North Korea.” Can you respond to that? Do you think that’s an accurate characterization? Can you tell us where the administration’s thinking is right now when it comes to taking some type of military action against North Korea to stop its provocations? MS. SANDERS: As I’ve said many times before, we’re not going to broadcast our actions, and we’re keeping all options on the table. Q Thank you. I’ll ask you the question I was going to ask Stephen. The President said in an Economist interview in May — he was asked whether he supports cutting the number of immigrants who can come here legally. He said, no. This bill today that he supports would cut the number of green cards issued by half. So when did the President have a change of heart on this issue? MS. SANDERS: I’d have to see the specific reference. But I know that the President has talked pretty frequently about merit-based immigration reform, not just on the campaign trail, but he’s been talking about this for years. And I can’t comment on a story I haven’t seen specifically. MS. SANDERS: I think Stephen spoke pretty extensively on that, and I don’t have anything to add beyond that. Q Thanks a lot, Sarah. The President, in signing this sanctions bill today, issued a signing statement. And in that signing statement, he said that the bill is significantly flawed. He said that there are provisions in this bill that are clearly unconstitutional. Why would he sign this bill if he felt so strongly that this bill inhibits his ability to act as the Commander-in-Chief and to carry out his duties as President? MS. SANDERS: I think I spoke on this already, but primarily because the President favors tough measures to punish and deter the bad behavior of the rogue regimes in Iran and North Korea, and he also sent a clear signal that we won’t tolerate interference in our democratic process by Russia. I also said that he signed it in the interest of national unity and, again, in support of — there’s no question that there isn’t support for the principles of the bill; it’s maybe just some of the process pieces. Q I’m sorry — does he also send a signal in signing this particular legislation that, if another bill comes before his desk that he also finds significantly flawed and clearly unconstitutional, that he’d sign that legislation as well? MS. SANDERS: I’m not going to speak about a hypothetical bill that we don’t know and doesn’t exist and whether or not the President is going to sign it. Q Sarah, can you clear up some confusion? There were almost simultaneously two signing statements that went out. They had slightly different language. Did you intend to send both out, or was that a mistake? MS. SANDERS: It was actually one signing statement and one press statement, so that’s the difference. One is more of a legal document that goes with the executive secretary, and the other one is a press document. So that’s the difference. Q I wanted to bring up some unfinished business. When you were named Press Secretary, because there was so much focus on the other announcement, that you only had a chance to talk about the job in one question. So I wanted to give you a chance to answer two questions that all of your predecessors faced. The first one is, what is your overall approach to the job, especially in terms of balancing whether you’re serving the President or serving the public? And secondly, do you see any circumstances where it’s appropriate to lie from the podium? MS. SANDERS: I’ll take the second one first. Absolutely not. I don’t think it’s appropriate to lie from the podium or any other place. On the first question, I think that the balance — my job is to communicate the President’s agenda, the President’s message, and answer your questions on that as best that I can, as honestly as I can, and as transparent as I can possibly be at any given moment. Q Thank you, Sarah. Following up on the question about the position, what exactly is Sean Spicer’s role in this administration at this point? And how much longer do you expect him to stay on staff? And then something on the signing statement. MS. SANDERS: As he said, I believe that was, gosh, a week or so ago. The days all kind of run together now. But he was going to stay on in a transition process through August, and nothing has changed. Q So nothing changed because of Anthony Scaramucci leaving? MS. SANDERS: No, nothing has changed at this point. Q Okay, and then on the signing statement, one of the things that it said was that it would drive China, Russia, and North Korea much closer together — these sanctions. Can you elaborate on that? Because yesterday you suggested that China was both an ally and a partner. MS. SANDERS: I don’t have anything to comment beyond the signing statement itself. Q Sarah, can I just follow up? Two questions. On DHS, should we expect that more into September, when Congress comes back, a nomination? Or is that possible soon? And the second question is, lots of lawmakers, Republicans on the Hill, and the business community have been concerned that the President won’t stay focused on tax reform, that this is something they really want him to talk about. And you just introduced immigration. You’ve got healthcare still hanging. Is the President going to focus on all of those issues in the weeks ahead, going into September? Or does he really want to showcase just one or two things? MS. SANDERS: As we’ve said many times before, we can walk and chew gum at the same time, and we can work on a multitude of issues at the same time. In terms of the DHS appointment, I don’t have any personnel announcements at this time. Q Yeah, thank you, Sarah. This morning, New Orleans Mayor Mitch Landrieu, president of the U.S. Conference of Mayors, took a shot at Tom Homan, the head of the Immigration and Customs Enforcement. On June the 28th, right from that podium, Mr. Homan said, and I quote, “Most law enforcement officials in cities work with us but many don’t in the largest cities. And that’s where criminal aliens and criminal gangs flourish.” Mayor Landrieu this morning said he’s wrong about that; that kind of rhetoric is not helpful. And he added that police officers keep the streets safe irrespective of immigration status, and do so all the time. Your response to Mayor Landrieu and his charge against someone who is mentioned frequently to be the next Secretary of Homeland Security? MS. SANDERS: Look, I think Tom has served our country well. He’s been active in law enforcement. And I would certainly trust his opinion very — a lot of confidence in him and his ability, having been in a multitude of different positions within law enforcement and been able to see it in a lot of different places, not just one location, like the mayor. So I would certainly defer to Tom on this issue. Q So then you would — you trust him more than you would Mayor Landrieu on that issue? MS. SANDERS: I think that’s pretty safe to say, John. Q Yes. Jeff Flake, in a Politico Magazine article, said the President was — he suggested the President was a carnival barker and had eroded conservatism. Is the President still thinking of helping to fund the $10 million challenge against Senator Flake? And does he have any response to Senator Flake’s comments? MS. SANDERS: I’m not sure about any potential funding of a campaign. But I think that Senator Flake would serve his constituents much better if he was less focused on writing a book and attacking the President, and passing legislation. Q Two American soldiers were killed today in Afghanistan. That’s nine on the year. Does the President know about this? And does he feel any sense of urgency to implement a new plan in the conflict there? MS. SANDERS: I can’t comment on that at this time, but I’ll certainly keep you posted. Q Thanks, Sarah. Did President Trump feel pressured into sign the Russia sanctions bill? MS. SANDERS: No. As I’ve said, the President supports putting pressure on these three countries in particular, and so he supports the principle of it and wanted to take action in that course. Q I just wanted to follow up. You were asked yesterday by Jared Rizzi whether the President would weigh in on this question of cost-sharing payments. Can you put this to bed? Will the administration continue making these cost-sharing payments or not? MS. SANDERS: The CSR payments are belling out at this point — a failed law that the President wants to repeal and replace. Since last year’s campaign, the President has been clear that Obamacare is a failed law. He’s working with his staff and his Cabinet to consider the issues raised by the CSR payments. And without Congress fulfilling its promise to American voters in repealing and replacing Obamacare, insurers will continue to flee this failing system. We need real reform that actually lowers cost and provides more choice for Americans. And we’ll keep you posted when we have a final announcement on that.